For schools with a limited budget, including digital resources in your library catalogue through SCIS adds value to your collection without the price tag, as many are free of charge. Downloading these records and resources from SCIS also ensures that you are cataloguing credible and educational resources to build the foundations for digital literacy in your school. Incorporating digital content in your library catalogue makes a richer search experience for your library users. The SCIS catalogue points to a variety of learning experiences — many of them interactive. In addition, searches won’t be limited to items made available by commercial publishers. For example, the SBS resource ‘My Grandmother’s Lingo’ (SCIS no. 1784795), which may not have been accessible in a more traditional catalogue provides a truly unique experience for students. The inclusion of digital content in your library catalogue ensures that it is a ‘one-stop shop’ for your staff and students. Say you have a subscription to a platform like Wheelers ePlatform One. Rather than asking your students to access different platforms based on their information needs, you can include catalogue records for Wheelers content within your own library catalogue. How can I use SCIS as a selection tool for digital content? Three methods for downloading digital content from SCIS are outlined below. The Digital content page in SCIS provides access to batches of recently catalogued records. For most effective use, we recommend adding this step into your cataloguing workflow to find new, educational content for your catalogue — whether it’s once a month, once a term, or once a semester. For instructions on using this feature, please see Downloading records of digital resources. Our Collections page (previously known as Special Order Files) is a valuable way to download bulk records from particular education content platforms and providers. 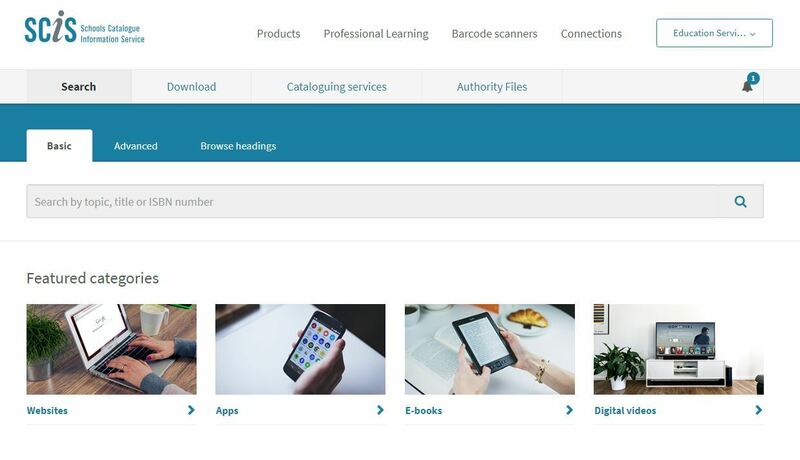 SCIS works with content providers such as ClickView to catalogue titles, meaning that schools subscribed to these platforms can download and import bulk records directly into their catalogue. The Collections page also features resources curated by the National Library of New Zealand. Simply select the collection you wish to browse, choose the most relevant file, and click ‘Download’. More information on how to use this feature is available at the SCIS help centre. Another method for downloading records for digital content is by browsing the SCIS catalogue. As it gives a broad view of what’s available, this method will give you the most control in terms of curating your own content. On our Search page, you will find four categories: websites, apps, ebooks and digital videos. If you’d like help downloading records from the SCIS catalogue, please see this help article. Project Gutenberg is a website that publishes free ebooks that are no longer in copyright. For those interested in including Project Gutenberg in their library catalogue, click on the ‘Ebook’ section of the Search page and enter the search term, ‘Project Gutenberg’ (including the quotation marks). You will find over 380 ebook records that you can then choose from and download. Once you import these records into your LMS, your students will be able to search and access them — this is perfect for schools whose budgets may not support subscriptions to paid ebook platforms. If you would like any particular item catalogued that isn’t already in SCIS, please submit an online cataloguing request. Of course, to ensure we are only cataloguing high-quality, educational resources, any such content must meet our selection criteria. If you have any questions about cataloguing digital content, we’d love to hear from you. Please contact our customer service team at help@scisdata.com. To find out more about the inclusion of digital content in your library catalogue, please register for our webinar Digital content in the 21st century library catalogue. The webinar will be co-hosted by teacher librarian Cathy Costello, who will discuss how digital content can be shared and promoted in school libraries. Thanks for the info and the link to webinar. Hi Roseanne, Thank you for your comment – we are glad you found this information valuable. Kind regards, Nicole.